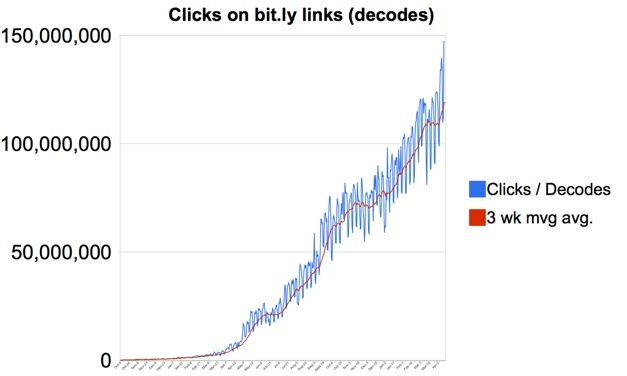 The default link shortener on Twitter, bit.ly, just keeps getting bigger. In March, 3.4 billion bit.ly-shortened links were clicked on, up from 2.7 billion in February and only 87 million a year ago. Yesterday was a record day for bit.ly, with 147 million clicks (see chart). Even though Twitter still dominates, more than half of all bit.ly links are encoded somewhere besides Twitter.com. Of the 40-50% created within the Twitter ecosystem, a large chunk occurs via Twitter clients and services. But other services such as Facebook are growing as well. About 100 million clicks last month went to Facebook. The diversification will only matter if Twitter ever decides to replace bit.ly as the default shortener with something like twee.tt, which Twitter owns. But there is no indication any change is imminent. The Promoted Tweets which Twitter is about to roll out as its first advertising effort, for instance, use bit.ly links. The service is about to get an update with a host of new features coming soon. For example, on the site when you paste a URL to be shortened, it will just shorten it automatically without the need to click a button. Managing your shortened links will also become easier. A new search functionality will index the underlying pages of the links you’ve shortened and let you find those links by typing in search terms that match any words on those pages. Also, all the links you share publicly via bit.ly will appear in your own public timeline of shared links. Finally, bit.ly Pro will also add premium features for which bit.ly will begin to charge companies to access. Since the launch of the beta, 6,000 organizations have signed up for the free version of bit.ly Pro, which provides custom short URLs for nyti.ms, tcrn.ch, 4sq.com, pep.si, and n.pr. The enterprise version, which will cost $995 a month, adds a management dashboard showing all traffic to the custom domain, a realtime feed for click data, and automatically shortens all links from the publisher’s site to their custom short link on bit.ly or any app that uses the bit.ly API.